I can remember being at my grandma Hazel's, sitting on the floor next to her big pile of fabrics. I loved picking out color-coordinated material for her to make clothes for my dolls. I was so thrilled that she always added fur around the cuffs and necklines of my Barbie's suit jackets. I would help by sewing on the little snaps and buttons. She was always so patient, showing me how to thread a needle and how to tie a knot on the thread ends. While I watched her cutting the fabric, without a pattern, it seemed so natural to her and I must have inherited how to do things without patterns or instructions. My first artistic endeavor was making fan-folded tissue paper flowers. I sold them in front of the Alpha Beta grocery store (my daddy was the store manager) on Beach Boulevard, in Stanton California. I was in the sixth grade. It was fun sitting there with people stopping and saying how nice my flowers looked, buying them for 25 cents each. WOW! My first income and I truly enjoyed the feeling and satisfaction of making something with my own hands and putting money in my own piggy bank. 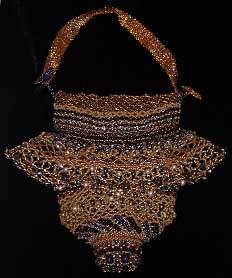 I was always interested in anything to do with weaving fibers, from macramé yarn wall hangings to handmade baskets. I wanted to use beads for my abstract woven wall hangings and it was hard to match some of the colors. That's when I started making my own oven-baked clay beads and using small glass beads. After playing with the small glass beads, I started stitching them together. That's when I made my amulet bag necklace. Self-taught, no "how-to" books. Working at a gold prospecting and bead store in Boise, Idaho. In the early 1990s, I taught a class on making dream catcher earrings. From 1995 to 1999, I worked and taught beadwork at Crafter's Choice in Boise, Idaho. I sold my work at craft shows starting in the 1990s at the Hyde Park State Fair (when it was in the street). Boise River Festival Art Show, the Goddess Fest, 6th Street Fair, Kuna Days, Emmett Cherry Festival, the Boise Blues Society "Blues at the Zoo" and at a Native American powwow at Montour, Idaho, Pocatello, Idaho, Nevada and Reno. In April 1998, at the Boise Art Museum, in conjunction with the exhibition "Pure Vision: American Bead Artist," I did beading demonstrations. My beadwork has been advertised and sold in Sun Valley, Idaho at Art and Soul Gallery and the Boise Art Museum. I also taught my beaded E-Bead necklace in Sun Valley, Idaho. I started the Boise Bead Society July 15, 1998. Since the early 2000s I've sold my beadwork on E-bay, Blues at the Zoo and Seasons on Thyme all in Boise, Idaho, and donated many pieces to my favorite charities. In 2007-2009 I sold my jewelry at Kaye York's Gallery in Cambridge, Idaho. I offered beaded evening bags and jewelry at the Gallery at Hyde Park, 1513 North 13th Street, until they closed their doors in September 2009. At this time I'm in the process of teaching beading classes again. Thanks for looking at my one-of-a-kind beaded jewelry and please enjoy.